Groups of brain regions that synchronize their activity during memory tasks become smaller and more numerous as people age, according to a study published in November 2016 in PLOS Computational Biology. A release from the publisher explains that typically, research on brain activity relies on average brain measurements across entire groups of people. In the new study, Elizabeth Davison of Princeton University, New Jersey, and colleagues describe a novel method to characterize and compare the brain dynamics of individual people. 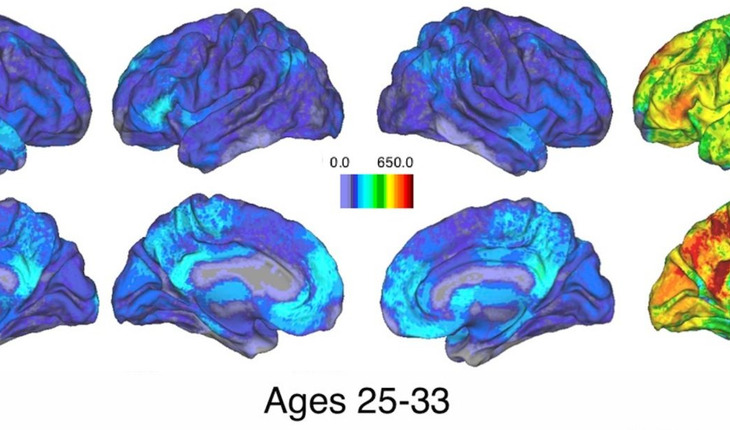 The researchers used functional magnetic resonance imaging (fMRI) to record healthy people’s brain activity during memory tasks, attention tasks, and at rest. For each person, fMRI data was recast as a network composed of brain regions and the connections between them. The scientists then use this network to measure how closely different groups of connections changed together over time. During memory specifically, variations between people are closely linked to age. Younger participants have only a few large synchronous groups that link nearly the entire brain in coordinated activity, while older participants show progressively more and smaller groups of connections, indicating loss of cohesive brain activity–even in the absence of memory impairment. Image credit: Davison et al.